Evidently there’s a Siblings Day. I became aware of it late on April 10th through the numerous postings in my Facebook newsfeed about it. When the hell did that happen? And, if it’s now a bona fide day of family recognition, where will this end? I found out there’s already a Cousins Day, for example. Assuming I’m not the only person asking these questions, I’m writing to provide a little background on this obscure holiday, as well as a few personal thoughts about my own siblings. There’s a lot more information about it in this fact sheet located on the foundation’s website. For example, the date of April 10th was picked because it was the birthdate of the founder’s deceased sister. That, as the website says, “the bond between siblings is usually the longest relationship of a person’s life” is certainly true. I remember pointing this out to my nephew Liam a year or two ago when he was angsting about his sister and yelled at the top of his lungs, “I hate Ayla!! !” I counseled him then that the day will come when he needs his sister and that his relationship with her will be the single-most important one he develops through his whole life. Of course, he looked at me like I had corn growing out of my ears. 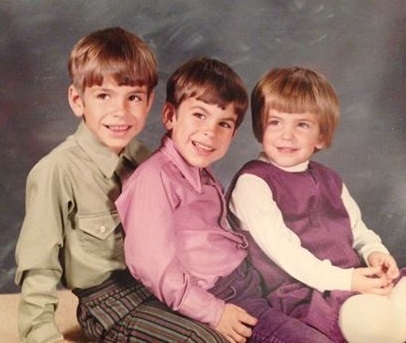 I certainly had my ups and downs with my two brothers, Bill and Wayne, particularly when we were very young. I remember being terrified of being left alone with Wayne and often used to wonder, had Billy not been there to protect me from him, whether I ever would have survived toddlerhood. There was the time Wayne pushed my head under water while I was learning how to swim, the time he got a bunch of neighborhood kids to help him stick me in a hammock and spin me over and over again until I threw up, and the countless times he used to kick me under the table. The most depressing instance was the time Wayne successfully got my mother to believe that I had used the F word. I was probably 8 at the time and I had never even considered using the F word. I’ll never understand, given Wayne’s history of shenanigans, why my mother believed him. At any rate, Mom attempted to wash my mouth out with soap – except there wasn’t any water involved. I can still taste the chunks of Coast that were scraped off in my mouth under my little buck teeth. It went on like this for years between me and Wayne. Our relationship didn’t turn around until Billy went to college and it was just the two of us left at home, he a high school senior and I a junior. Wayne had realized that it was handy to have a popular sister who could potentially provide access to girls. In my “new” relationship with Wayne, I was touched that he asked my help putting clothes together for him to wear to school. He seemed to blossom in several ways that last year home. In actuality, I probably just noticed Wayne more now that Billy was gone. That allowed me to get to know him better and to appreciate him. Billy and I, on the other hand, seemed to have been made from the same mold. We were high academic achievers, extroverts, and captains of our high school sports teams. That we were so much alike and so difficult to ignore were probably the main reasons Wayne seemed to have so much trouble growing up. He might have felt unnoticed and under-appreciated, and that led to outlandish behavior to get attention. In high school, Billy and I had a nightly ritual of doing homework around the massive oak table in our family room. It was always a race to finish our assignments by 11:15, when the local NBC news broadcast ended, so we could watch “Star Trek.” When the mildly attractive and shapely meteorologist started her fumbling assessment of the next day’s weather, it was a signal to finish up, close the books, and be alert for Captain Kirk. Like the motley crew on the Enterprise, Billy and I always seemed to get along. Those nights doing our homework together are among my fondest childhood memories. Then the inevitable happened. We all grew up and went our separate ways. Bill was off to Clarkson University in upper state New York and then into the nuclear core of the U.S. Navy, where he remains today, presently out to sea with the rank of Captain. Wayne found college life wasn’t for him and joined the U.S. Air Force where he had a very long and decorated career. He’s retired from the military, but is back at the Wright Patterson base in Dayton, Ohio, as a civil servant. I went around the world in my studies and early career, ultimately settling back home in Vermont, just a stone’s throw from where the three of us grew up. All of this sibling talk is making me realize that we really need to make a point of getting together much more often. I’ve no opinion on whether or not there should be a national holiday to celebrate siblings. It all seems a bit too Hallmark-ish for me. However, I am very thankful to have taken this time to reflect on my relationship with my two brothers. And I’m pretty darned lucky to be stuck with them.